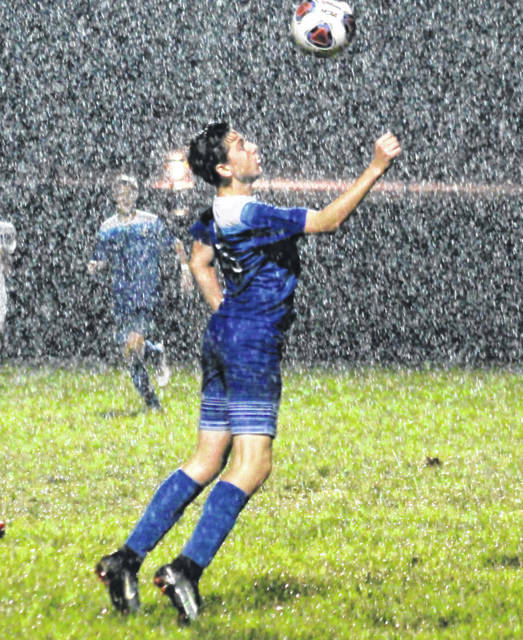 Gallia Academy freshman Brody Wilt goes up for a header, during the Blue Devils’ match with South Point on Thursday in Centenary, Ohio. CENTENARY, Ohio — Alas, another tally on the end of the record. 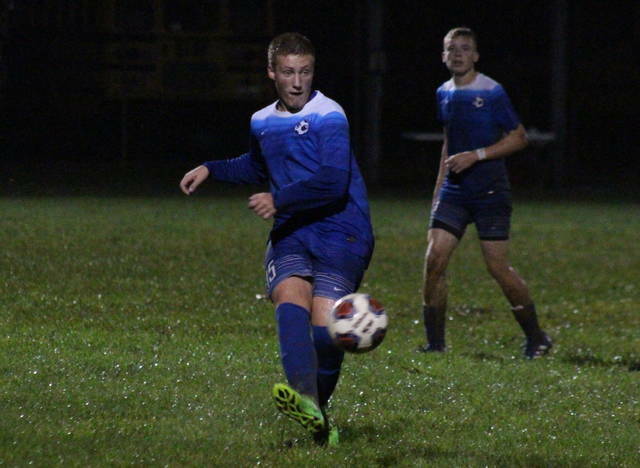 The Gallia Academy and South Point soccer teams battled to a 1-1 draw on Thursday at Lester Field in Gallia County, giving each team three ties on the season. After a rainy and scoreless first half, the Pointers (6-5-3, 3-4-2 OVC) took a 1-0 lead on an unassisted goal four minutes into the second stanza. The Blue Devils (7-3-3, 5-1-3 OVC) answered six minutes and four seconds later, as Brody Wilt found the back of the net for his own unassisted marker. 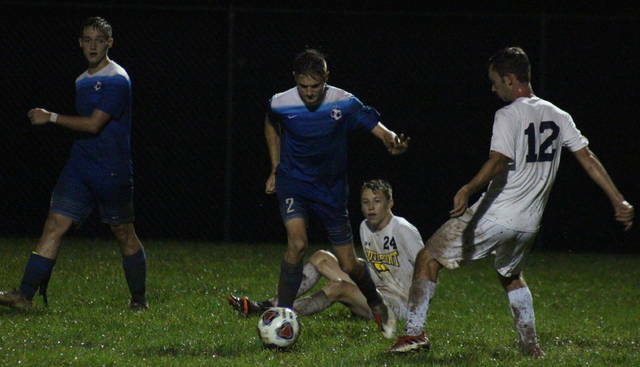 Gallia Academy held a 11-to-5 advantage in shots and a 3-to-2 edge in corner kicks. 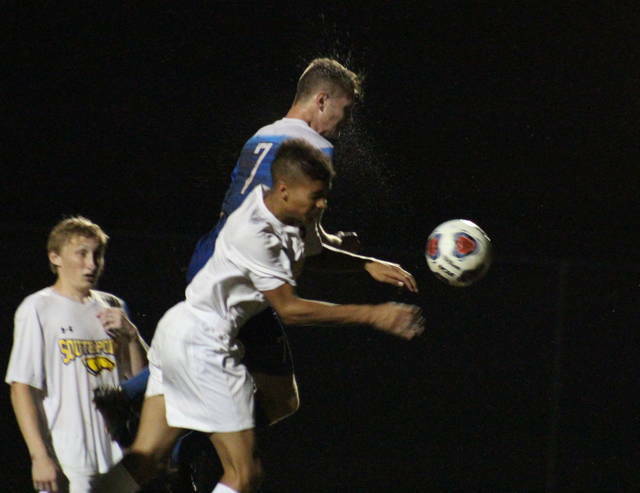 The Blue Devils finished the year 1-0-1 against the Pointers, after winning 4-2 on Sept. 11 in South Point. Gallia Academy will head into the final week of the regular season in second place in the OVC, one point ahead of Fairland. After hosting Jackson on Monday, the Blue Devils will wrap their league schedule at Rock Hill on Tuesday. The Redmen are unbeaten in the league and locked up the outright league title, thanks to the Blue Devils tying with South Point on Thursday.